What keeps Kohler Lawn busy in the winter? Welcome to Kohler Lawn and Outdoor’s first newsletter! We are looking to serve our customers better in 2018 by connecting with you through this newsletter. To let you know more about us and our business, we would like to share what our business does during the cold months when there is not green growing lawns to tend to. Continue reading below about how Kohler Lawn stays busy by working on large scale landscaping projects in the winter months. We enjoy customizing projects for our customers. 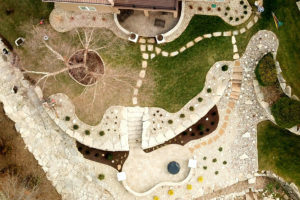 Think of what you would like in your dream landscape then give us a call for an estimate. Visit Kohler Lawn’s Pinterest Page see more images of these services. While it may seem like Kohler Lawn has an off-season, our season’s end runs right into the next season’s preparation. We close out the season with winter services like pruning, cleaning up the season’s debris, and aerating and seeding. In this season of transition, our laborers work on equipment maintenance while the office staff update mowing and snow removal routes and send out prepay letters offering a discount for the upcoming season’s turf services. Kohler Lawn & Outdoor was established in 1992 and is owned and operated by Clay Kohler of Pleasant Hill, MO. Initially he started with lawn maintenance. Then in 1998 he added landscaping to his services.